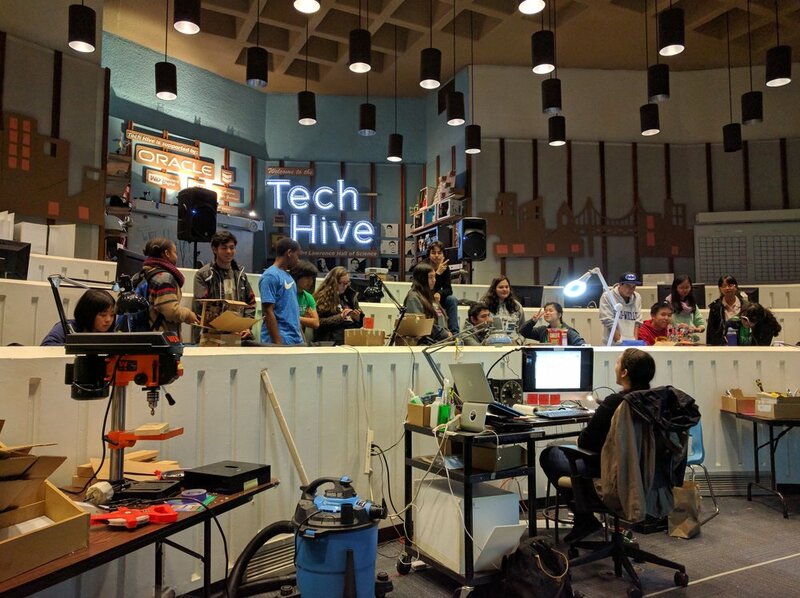 TechHive Winter 2017: Day 10! Here what you missed: In the last three weeks we wrapped applying our new skills to finish up Jamie, our one of a kind Explainer Robot! All in all it's been a successful and knowledge filled push towards are final goal and we got there as a team! Kudos to everyone involved and thank you again for all your support! Today was all about the various stages of design. Design → Build → Test→ Repeat! In the bottom row interns finished the last stages of our first group build. 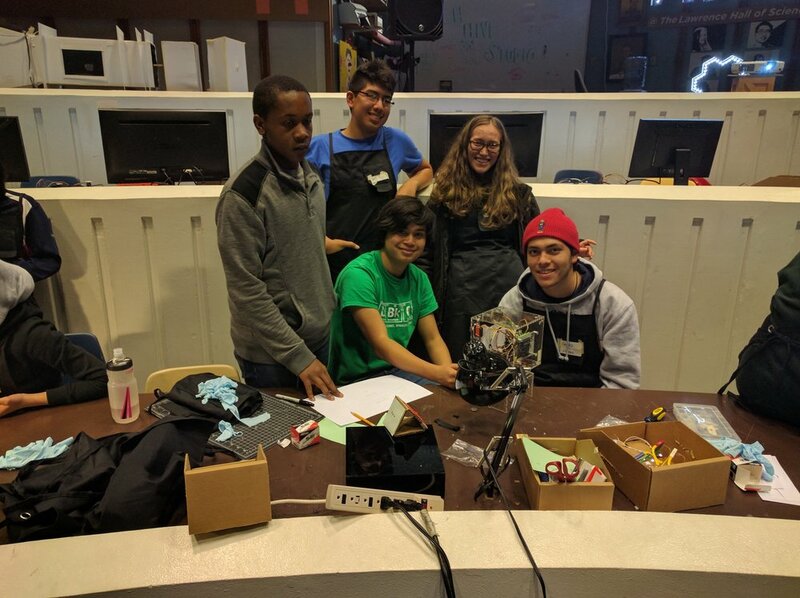 Attaching eyes, re-attaching them after they fell off, checking that wires were plugged in and skillfully handling all the minutiae that goes into making sure our robots work perfectly! The top row engaged in a completely different part of the design process (the funnest part actually): Design! 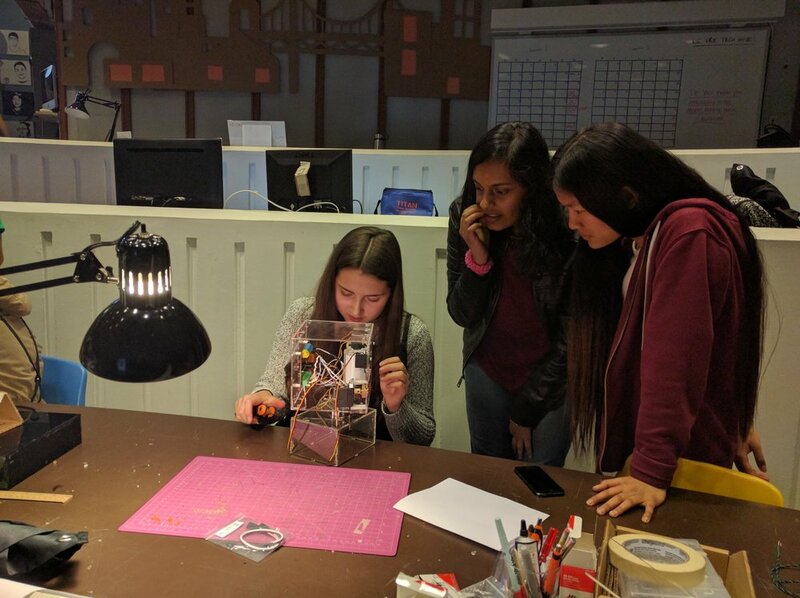 Groups worked together to redesign, an intern named, tool called "The Status Prism" that helps facilitators figure out how students are doing in their tasks from a quick glance. 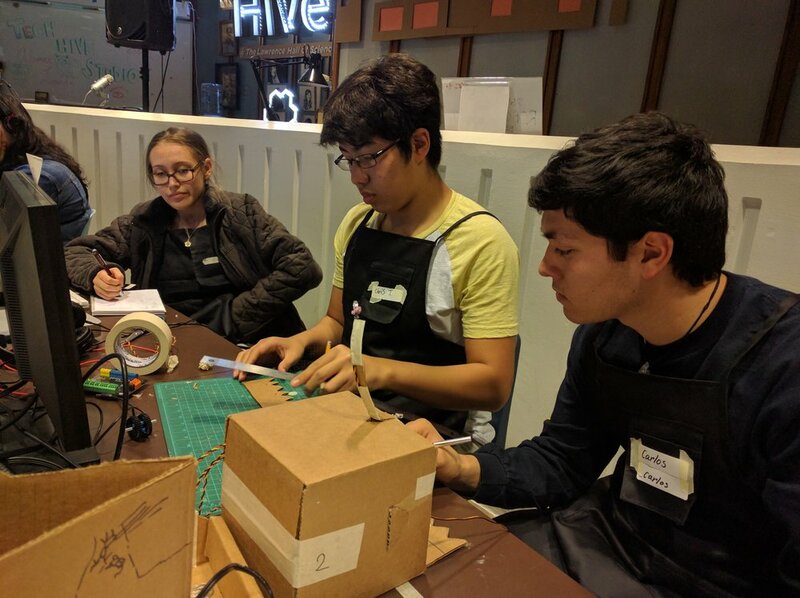 From learning the basics of breadboards and circuitry all the way through executing the their ideas with cardboard and wires interns got a very detailed look into design this week! 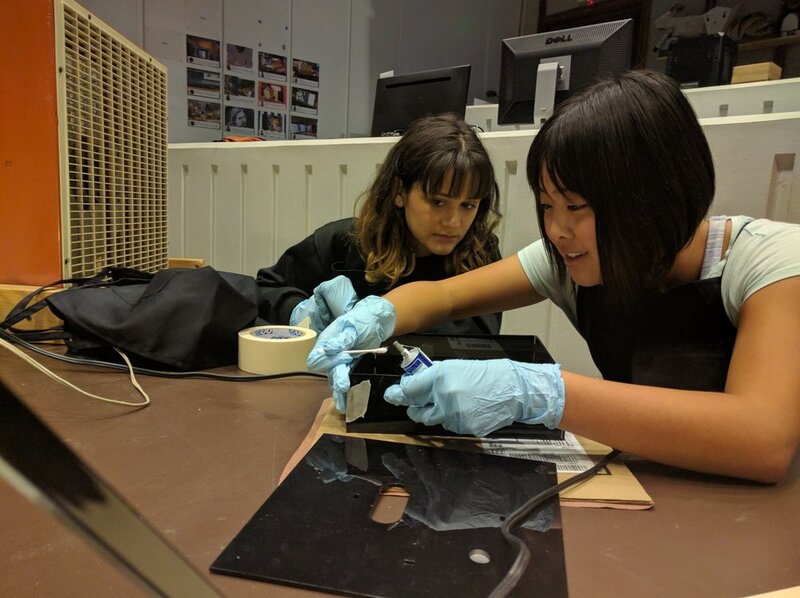 Kephra and Ana work at finishing the first stage of their robot. 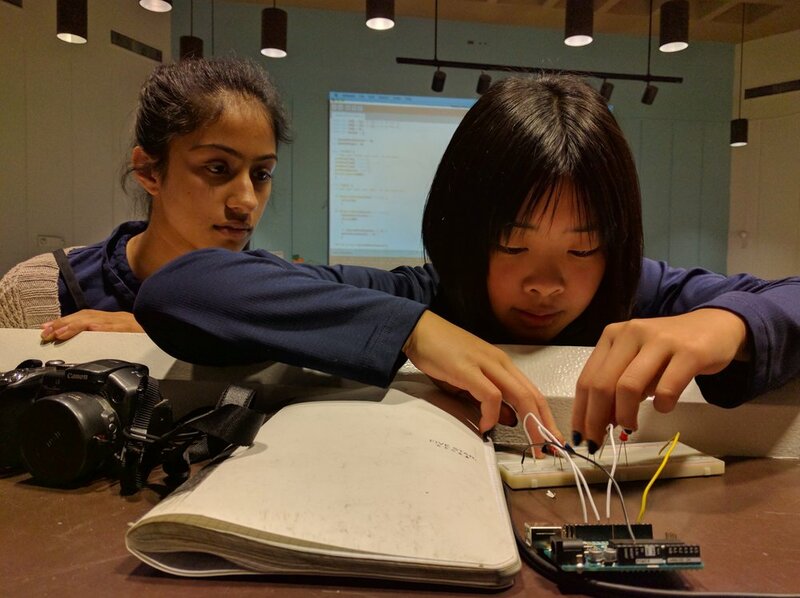 Simran and Ally work at implementing their "Status Prism" design's circuits. Senior Intern Sebastian helping Carlos out with their program. 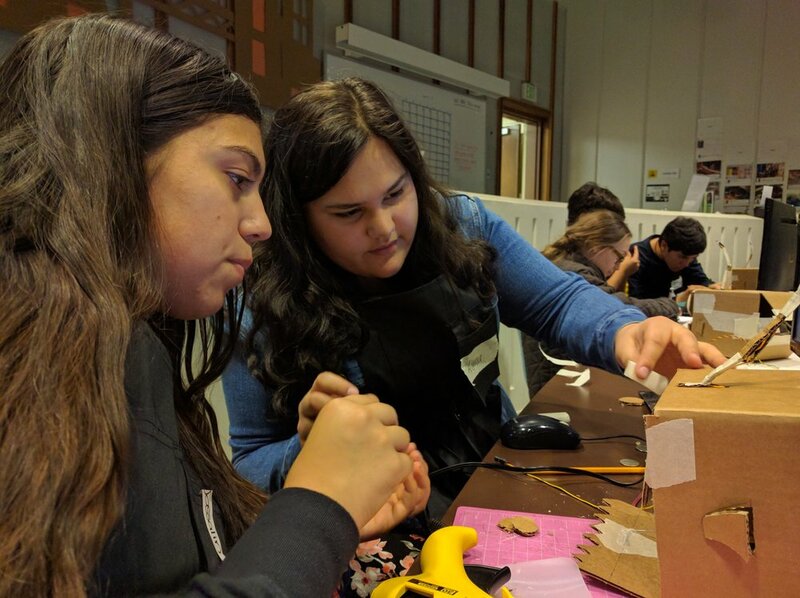 Jossalin and Alyssa finishing up their robot. 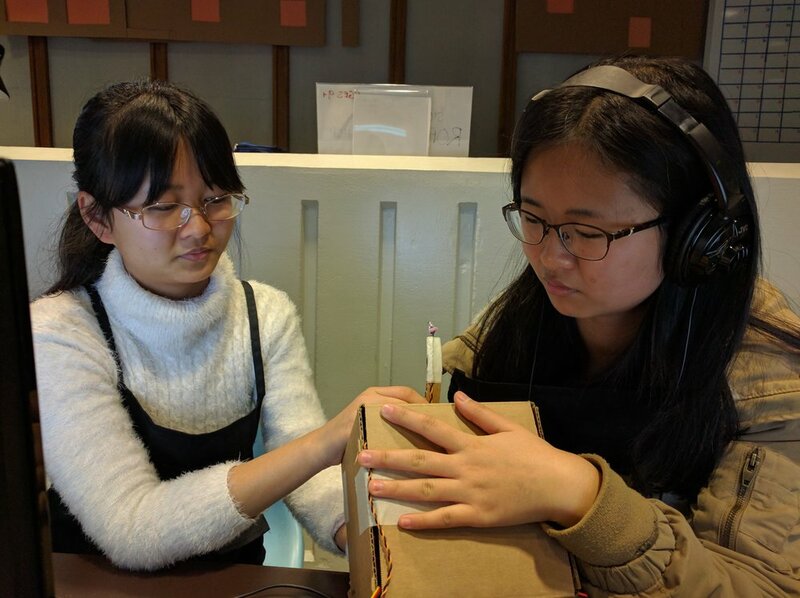 Qiyao and Qilu finishing up their robot. 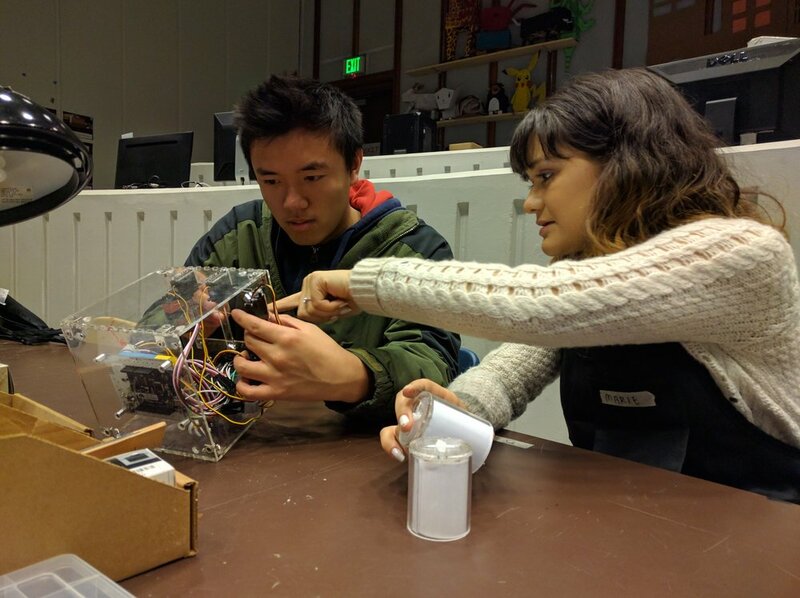 Marie and Edmond building the first iteration of their Status Prism. Carlos and Thomas working on their Status Prism. Norman and Jacob coding their Status Prism. 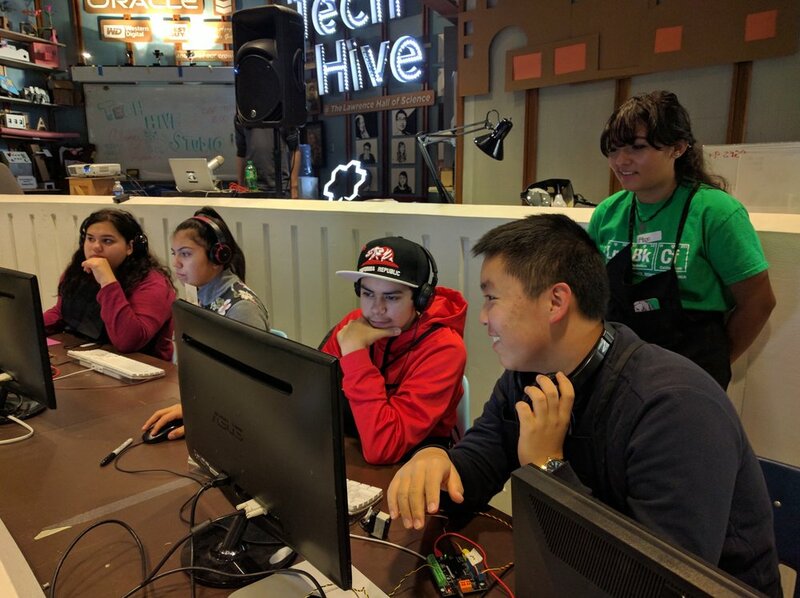 Last week, TechHive interns learned how to use variables, loops and If/ Then statements to bring their anger fish to life. This week, they got to put their new skills into practice as they iterated upon their angler designs. Interns created moving eyes for their fish, allowing them to experiment with emotive characters. Creating the illusion of emotion is central to making a successful animatronic character. 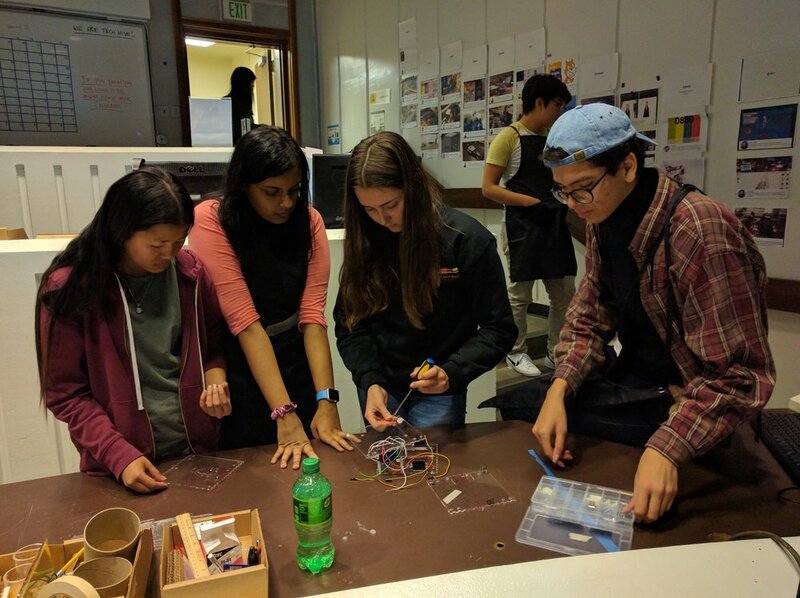 Additionally, interns assembled the eyebrow and eyelid mechanisms for their Explainer Bot. They also glued together the bodies and the platform for their Explainer Bot using an Acrylic Cement. 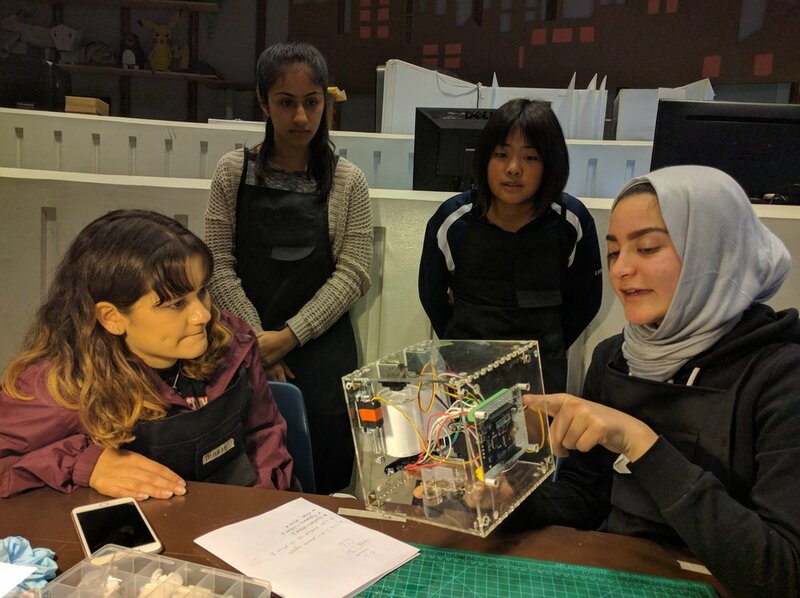 Understanding how to work with acrylic will be essential when the interns begin to design their own motorized feature for their robot. 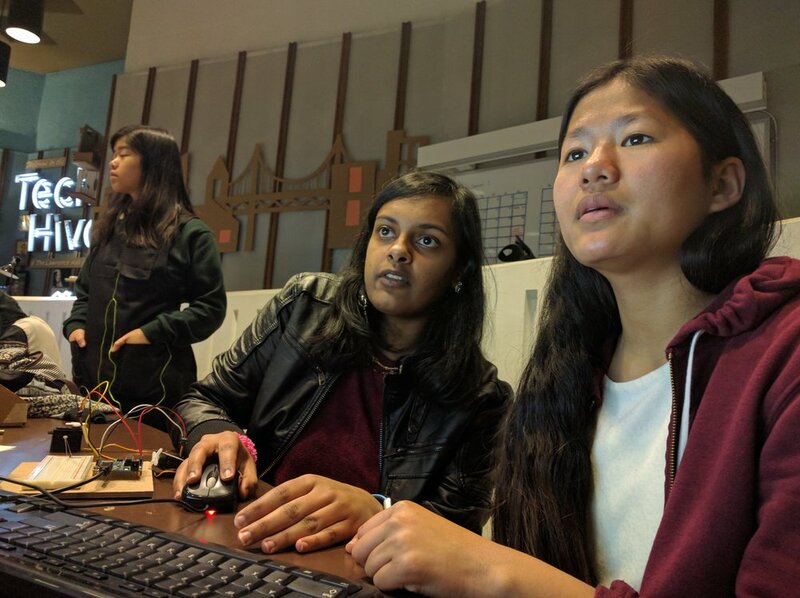 Ally and Marie assembling their Explainer Bot's platform. Chris and Carlos putting together their platform. 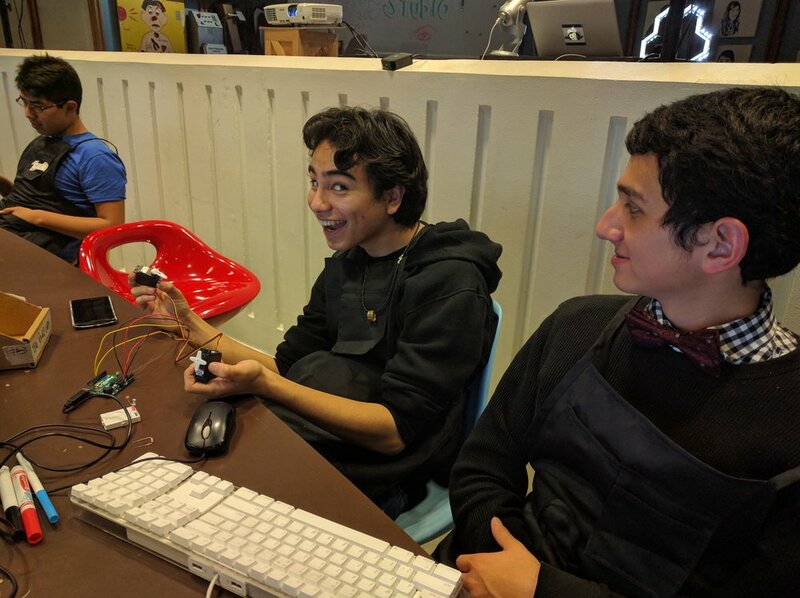 Allsion and Norma wiring the mouth of their robot. Thomas and Kephra adding the eyebrow servo to their robots face plate. 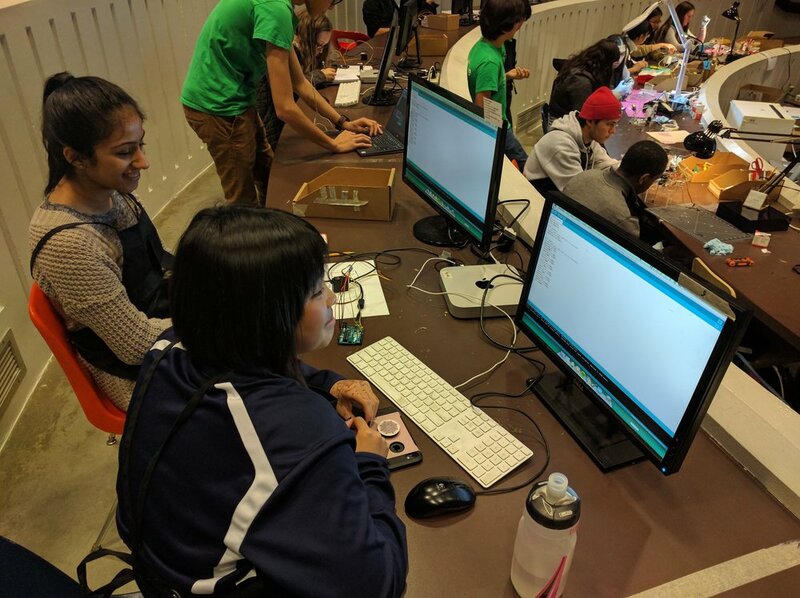 Neesha, Radhika, Roni and Leo assembling the head of their Explainer Bot. 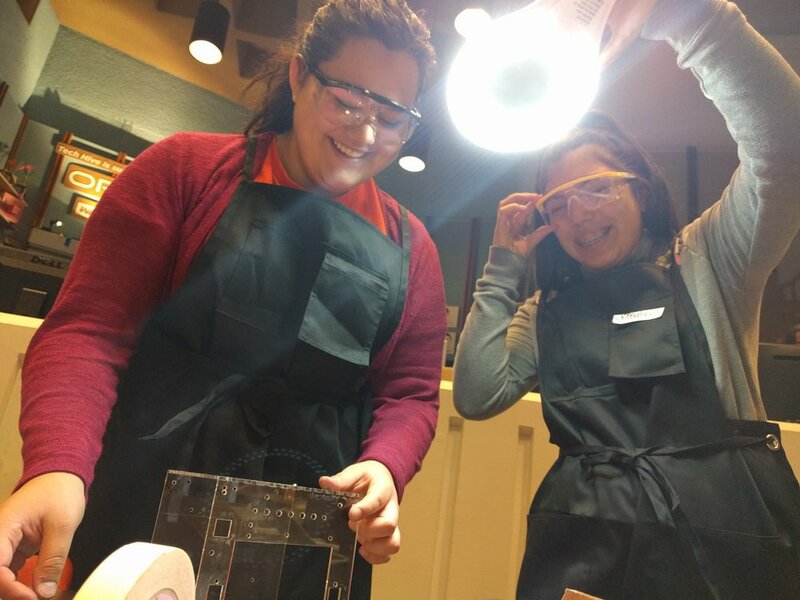 Edmond and Madeeha modify the edges of the moving eye mechanism in their angler. 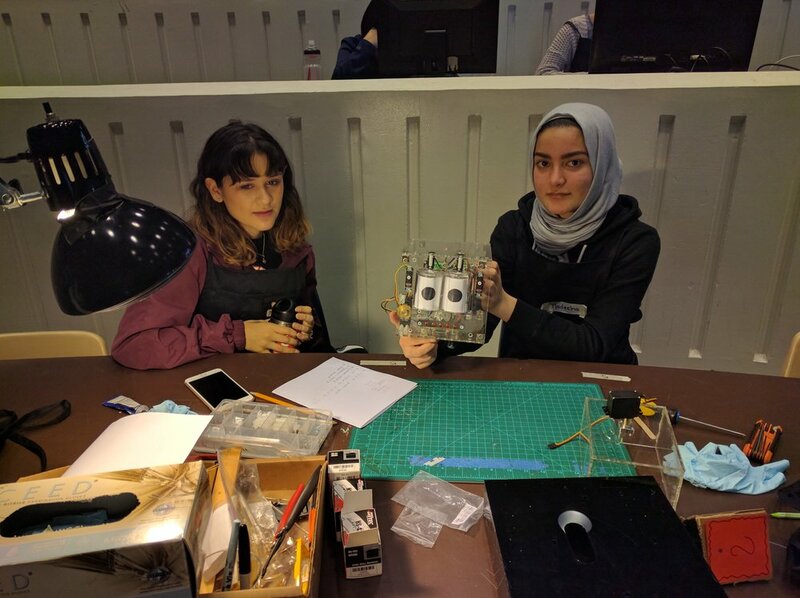 Marie, Madeeha and Ally attaching eyebrow servos their face plate. Thomas and Carlos iterate upon their angler design. 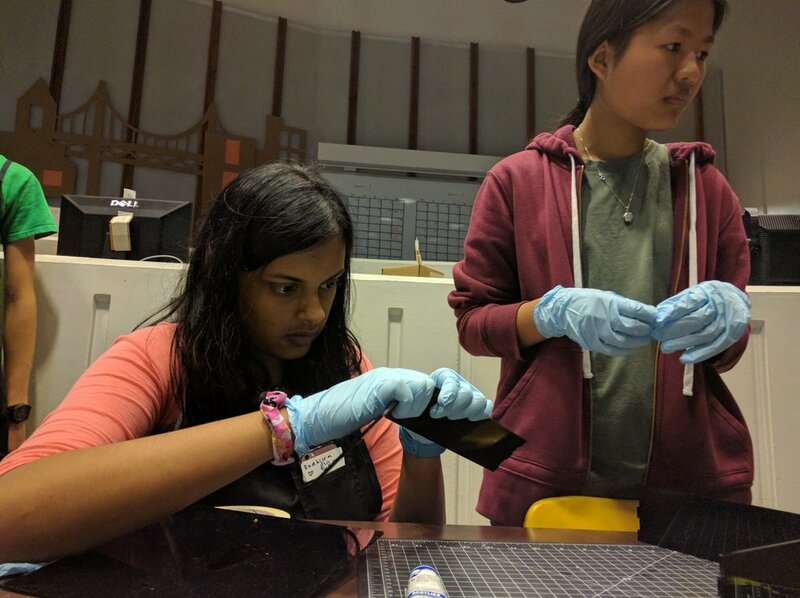 Neesha and Radhika gluing their platform together. 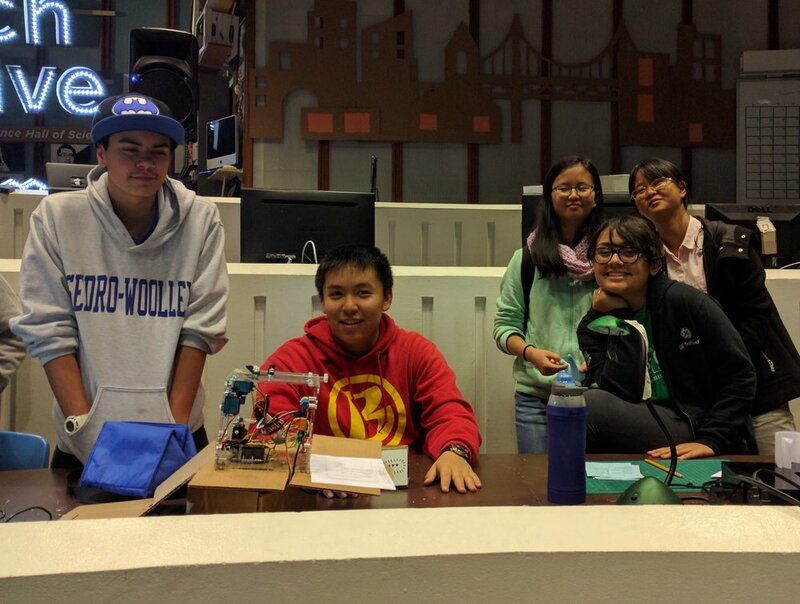 Today we began to assemble the Explainer Bot. While most of the Explainer Bot pieces were laser cut in advance, some components still needed to be drilled and counter sunk. For this, everyone was trained how to safely use a drill press. 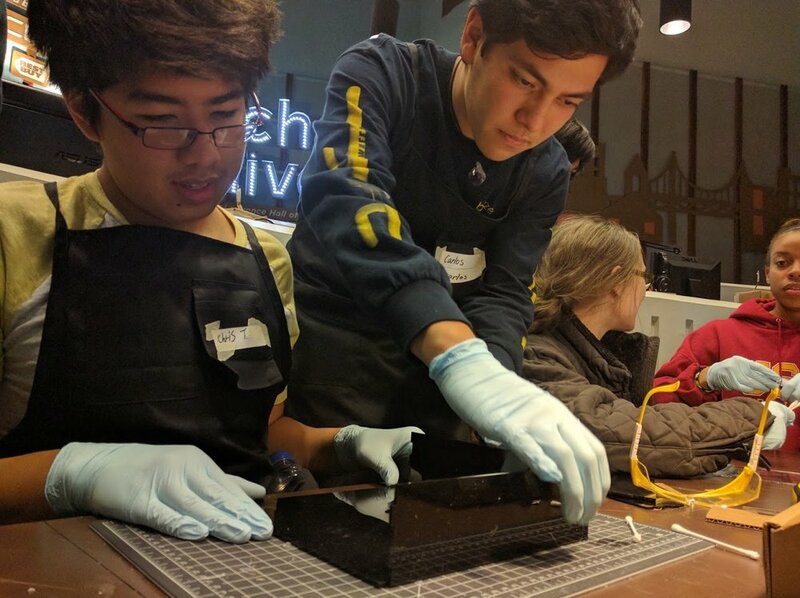 TechHive interns also got experience using soldering irons. The interns soldered leads onto the LED array that will become their Explainer Both's mouth. Knowing how to solder properly is a key skill when working with small electronics. 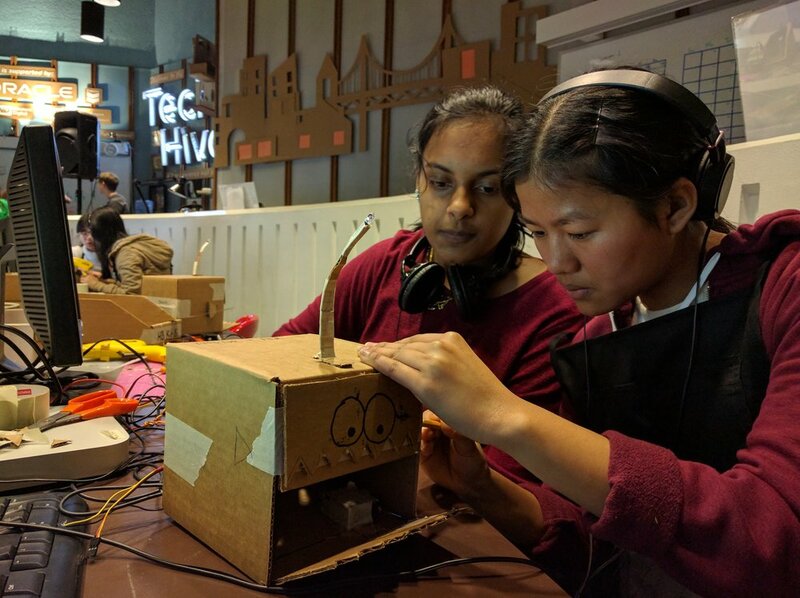 Half of the day was spent building the intern's programming and design skills through the creation of an animatronic angler fish. 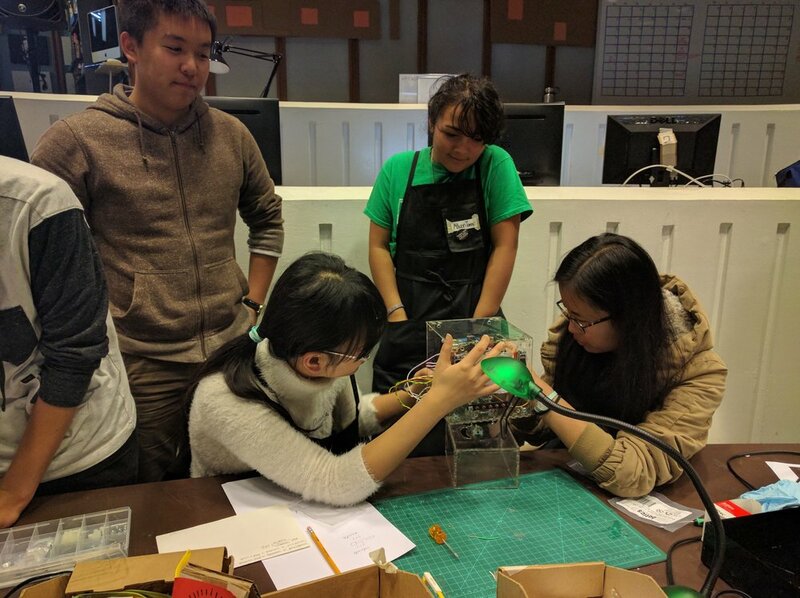 Interns made LEDs blink and Servos move using a Hummingbird Controller and Scratch programming. 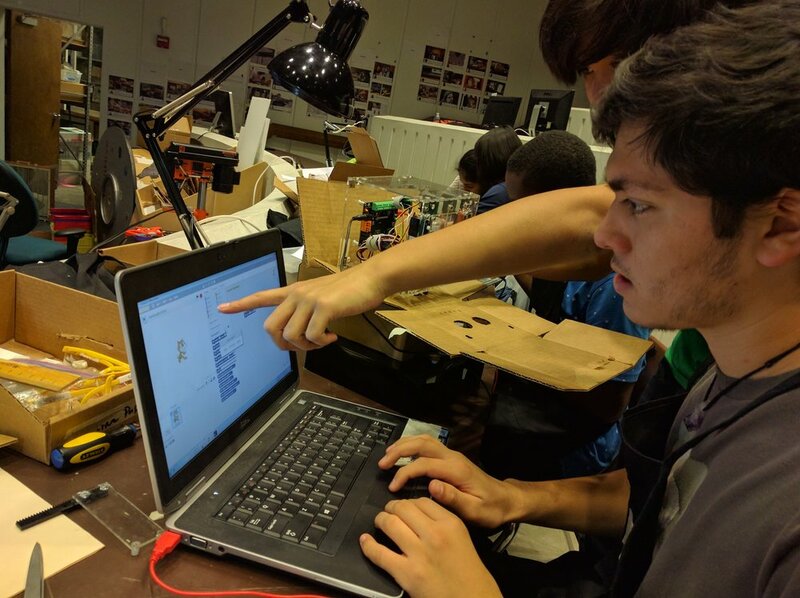 They also got a distance sensor to work using variable and loops in Scratch. These are the same tools they will use to make their animatronic Explainer Bots come to life. 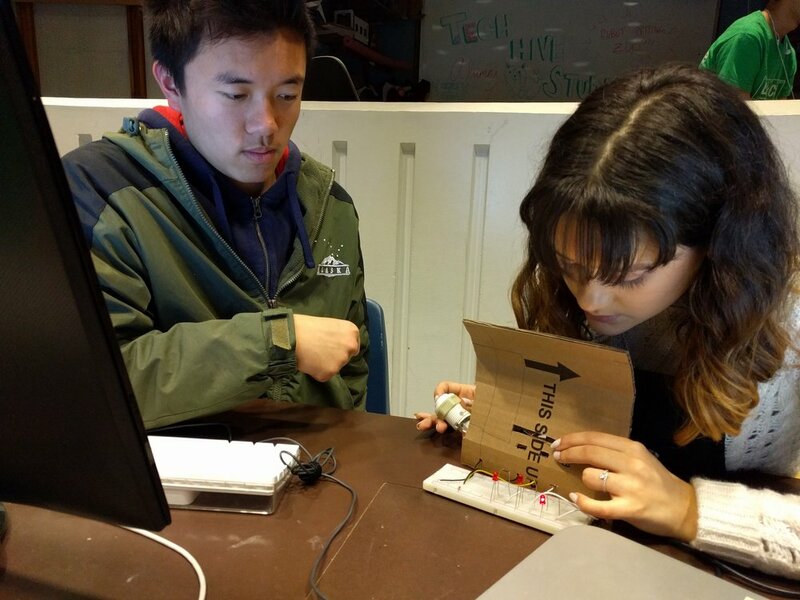 Chris and Ana building their programming skills. 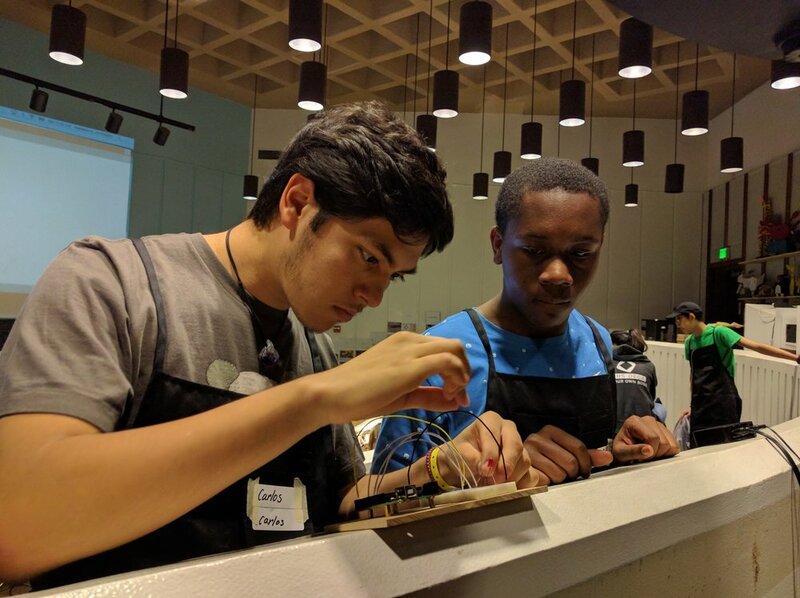 DJ, Javier and Thomas getting a soldering tutorial from Senior Intern Sebastian. 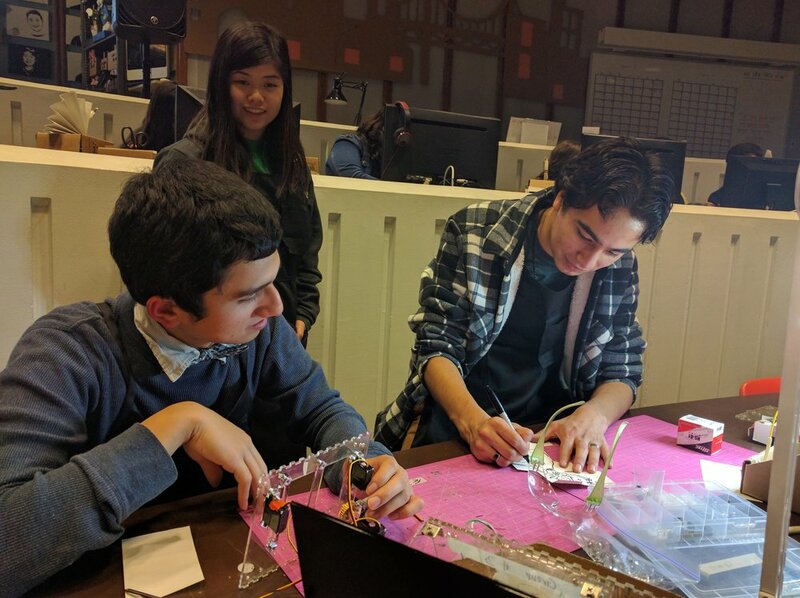 Edmond, Eirren and Simram assembling their animatronic angler fish. Norman and Jacob installing L brackets onto their Explainer Bot. Alyssa and Jossalin measuring the placement of the brackets on their Explainer Bot. 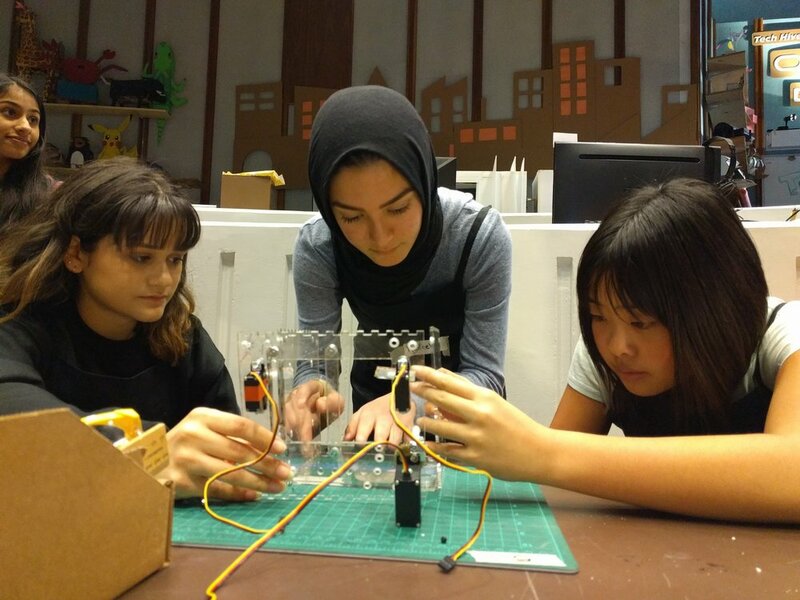 Roni, Marie and Madeeha soldering an LED array.